It’s known that Grammarly is a powerful grammar checker tool. But do you know that it has Grammarly Chrome extension that can be used in the real-time while writing anything on Google Chrome browser? If you don’t yet know about it, then this post is for you where I’ll also show how to use the extension on Chrome. Grammarly’s Chrome extension is a simple extension that can be installed and used smoothly on any Chrome browser whether it’s for 32-bit or 64-bit. The grammar checker company has made the task of checking grammar even easier by launching this fabulous extension because if the extension weren’t there, you would have to check your content by visiting Grammarly’s site. In addition, you wouldn’t be able to check your content in real-time. So the extension has brought the ultimate convenience when it comes to correcting your content from different grammatical, spelling, and punctuation related errors. Now, I’ll show you how to use this great tool in your browser. You can use it in Chrome or Firefox and as I use Chrome, I’ll show you how to use it in this browser. Note that the user process of both the browsers is almost the same. So, don’t worry if your requirement is to use the tool in Firefox. So, how will you use the tool in Chrome browser? To do this, firstly, you’ll need to land your Grammarly dashboard. On the page, you’ll see the Apps tab. You’ll need to enter into this tab which will take you to another web page on the right side of the dashboard. Currently, there are three panels and the top one is Grammarly for Chrome. You can see that the panel has “Active” on the right side of the panel. This is active because I’ve already activated the tool on my browser. You’ll see that the button color is red and there’s “Install” in it. If I hadn’t installed the extension before, then I would have also had the same “Install button” there. In fact, before installing it, I had the “Install” button shown on the right side of the panel. 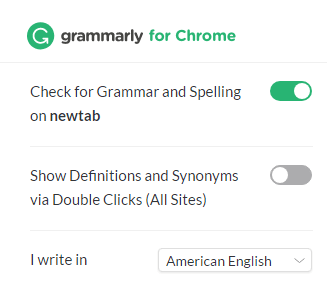 By the way, to install the extension Grammarly on your browser, you now need to hit the “Install” button. After doing so, the extension will be installed on your browser. Once the installation is complete, you could see the green Grammarly icon in the top right corner of your Chrome browser. Clicking on the button will open a popup sidebar where you’ll get the options to activate it for your browser. You can see that this is for my browser and I can use it for anything that I write using the Chrome browser. The best benefit that I get from the tool is that I can check every text on my WordPress. This is an invaluable advantage that I get from Grammarly and for this reason, I’m very much grateful to the tool. Also, enabling the tool on your browser means that the tool will start detecting flaws whenever you write anything on your search engines, new emails, social media posts on Facebook, Twitter, LinkedIn etc. Now, I can be relaxed by writing anything because I know that Grammarly’s digital eyes are there to protect me from doing any sort of mistakes in my writing. So far, I could correct so many mistakes in my writing and I’m still getting limitless benefits from Grammarly. Thank you! Grammarly for providing such a nice service that we can hardly imagine from a tool. Hey! Good to know that Grammarly is also usable on MS Word and here’s the Grammarly for Word review.